This review is for the Sound Soother white noise machine, made by Sharper Image. We include an overview of its features, as well as summary of its effectiveness and customer value. Overall Pros The Sound Smoother is effective for blocking out noise, with a wide selection of sounds and good volume control. The timer, alarm clock, and great appearance of this sound machine is popular with many consumers. Overall Cons The machine has a bright LED display, which is a negative for some owners. The Sound Soother is very straightforward to set up, particularly for a machine with additional features. The LCD display, though a turnoff for some consumers, makes it very easy to read the display and make adjustments to the noise or alarm in the dark. This LCD display can also be adjusted to suit your preference, which offers some relief to sleepers that are sensitive to light. The display makes it easy to see the alarm settings, both whether it is on and what noise will be used, and large buttons on the top of the machine make it easy to adjust the sound settings on the fly. A great perk is the option for battery power or AC adapter power, which makes the sound machine easy to transport on trips or put next to your bed if the outlet location does not permit. 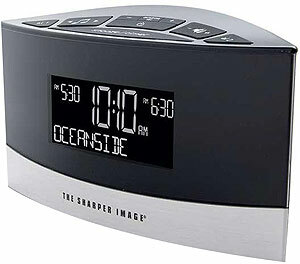 The Sharper Image Sound Smoother is priced at $48.50, which is on the higher end for sound machines. You can find machines with similar features for a lesser price, however we think that the reliability and design of this machine make it worth the extra cost if you’re willing to spend it. The machine offers 20 sounds that are all very high quality and diverse, so that a consumer can really try out a variety of sounds until one suits their preference. The volume can also be easily adjusted to both adequately loud and soft levels, making the sound output a very enjoyable experience. Other reviews have noted the sounds as “tinny,” though we did not share that sentiment after testing the noises. Our favorite sounds are Brook, Ebb Tide, and Heartbeat. Since it’s coming from Sharper Image, the design is of course very sleek and intentional. Most users find the design pleasing, particularly compared with other clunkier sound machines. The large display screen certainly makes it easy to access and understand the features, though this again may be an issue for those that are very sensitive to light. This is the main concern for most users, particularly those that do not enjoy an LCD display. The display can be dimmed, which we found to make it very tolerable, but it will ultimately depend on your own sensitivity.